The Medusa Touch is the chilling tale of a man with a gift for disaster. Richard Burton (Cleopatra, Where Eagles Dare) is John Morlar, a man with astonishing powers of telekinesis. When French detective Brunel (Lino Ventura-Army of Shadows) is tasked with investigating John Morlar’s murder whilst on assignment with Scotland Yard, he discovers that the victim is not as dead as he first appears. Working with Morlar’s psychiatrist Doctor Zonfeld (Lee Remick- The Omen), the detective reconstructs Morlar’s mysterious life. It is in the childhood memories of John Morlar that Kent makes its debut. The “Welcome Hotel”, where Morlar and his parents spend their holidays, stands in the coastal town of Herne Bay. Although the Hotel may have been fictional, the building remains the same. Spanning numbers 37-40 Central Parade in Herne Bay, the building is now a row of residential properties next to the Royal British Legion Headquarters. On their holiday the family also visit the nearby Reculver Towers for a seaside picnic. It is in this scene that Morlar first makes use of his powerful telekinetic abilities. Although the film was released in 1978, the Reculver Towers have stayed unchanged and are. a distinctive landmark on the Kent Coast They are the remains of a 12th Century church that once stood there among the ruins of a Roman Saxon Shore fort and a Saxon monastery, and part of Reculver Country Park which is a Special Protection area due to its rare cliff top meadows and the yearly migrating birds. The nearby coastal town of Herne Bay offers two miles of seafront lined with café’s, amusement arcades and fish and chip shops, all overlooked by stunning examples of Victorian Architecture. In true spirit of an English seaside town, brightly coloured huts line the beach and the location is popular with tourists every summer. The town is home to several antique shops and hosts one of Kent’s biggest markets every Saturday. Productions that have filmed in the area include Got To Dance (2012), Things I Haven’t Told You (2008) and French Dressing (1964). 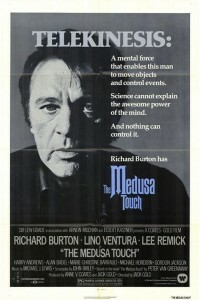 The Medusa Touch is now available to buy on DVD. This entry was posted in Filmed in Kent and tagged feature film, Herne Bay, Lee Remick, Reculver, Richard Burton, The Medusa Touch film locations. Bookmark the permalink.